Members of the Penn Manor High School Future Business Leaders of America fared well at a recent competition at the Lancaster Campus of Harrisburg Area Community College. 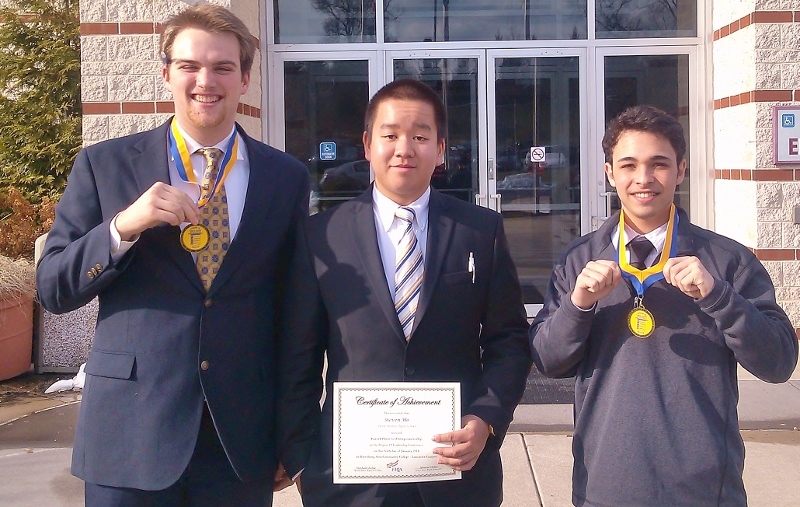 The Banking and Financial Systems team of Tanner Petratos and Eric Fraunfelter took first place at the Region 18 Conference, and the Entrepreneurship team of Steven Ho, Peter Lombardo and Jack Eilliot placed fourth. In addition, Tanner Petratos took fifth place in the Accounting II competition. The conference was open to all FBLA chapters in Lancaster County. With its first-place finish, Penn Manor’s Banking and Financial Systems team qualified to compete in the statewide conference in Hershey in April. Formed in 2012-2013, the local chapter of FBLA has grown from six members to 25. The group is open to any student who has taken or is enrolled in a business class at the high school. FBLA is for students who are preparing for careers in business or are interested in learning more about the free-enterprise system. Members learn how to engage in business enterprise, direct the affairs of a group and compete honorably in competitive events. Pictured, from left, are Jack Elliot, Steven Ho and Peter Lombardo. Pictured, from left, are FBLA members Jack Elliot, Steven Ho and Peter Lombardo.